There is a vigil and protest tonight in Suffolk County, Long Island, New York, to mark the gang of seven white teenage boys murdered Marcello Lucero, because they wanted to go get a “a mexican.” Marcello Lucero was, in fact, an immigrant from Ecuador. Lucero, 37, was a gifted athlete who moved to America 16 years ago seeking a better life. The seven racist white boys drove around searching for victims and found Lucero and another Ecuadorian man near the Long Island Railroad station. The white boys jumped out of the car and cornered the two men on the street, stabbing Lucero to death in a brutal attack. The other man escaped and was able to idenfity the attackers. The murder – lynching, even – of Lucero, follows months of racist, anti-immigration agitation by whites in Suffolk County. The teens accused of the attack were all from Farmingville, the epicenter of anti-immigrant organizing on Long Island. Farmingville first gained national attention in 2000 when two young men abducted a pair of Mexican day laborers and beat them nearly to death. Farmingville made headlines again a few years later when five high school students burned down the house of a Mexican family, who barely escaped with their lives. That racists are unable to, or perhaps unwilling to, distinguish between someone who is Mexican and someone who is Ecuadoran, speaks to the vast well of ignorance that fuels white supremacy. 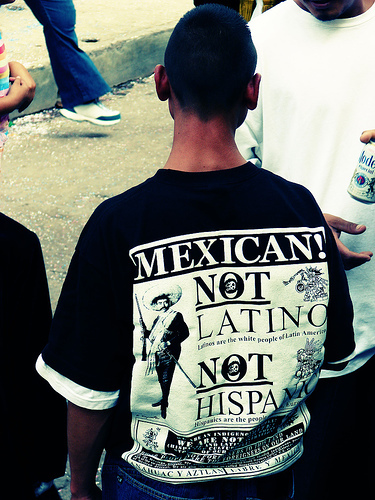 Yet, I wonder if it’s not time to revisit the acceptably white-liberal terms of “Latino” and “Hispanic” as they perhaps provide cover for better-educated versions of the same inability and unwillingness to distinguish between people of different cultural backgrounds (as the photo of this man’s t-shirt suggests). Some report being threatened and physically harassed in the streets, with bottles thrown at them and their car windows smashed during the night. Anti-immigrant epithets and racially motivated bullying are common in the hallways of the schools, children say. “They tell us to go get a green card, ‘Go back to your community!’ ” said Pamela Guncay, 14, an Ecuadorean-American born in the United States. This cognitive dissonance – and the actual distance – between these two points of approaches to a racist murder suggest a great deal about where we are at this moment socially and culturally around racism. In this instance, there is, in the present tense, a racist murder committed by young white boys in the affluent, suburban, north-eastern U.S. In response, “local officials” play down the idea that there is persistent racism in the community; one community leader even called it a “reminder” of the “saddest page in our history.” At the same time, activists are pushing those same officials to respond to the racist murder in various ways. This conflicted mix – of murderous, overt racism, along side denial of racism on the one hand, and pressure to act on the other hand – is characteristic of what we are faced with at this particular moment in the U.S. if we wish to address racism. Please send this to everyone you know far and wide, including those in New York. Tell them you’re taking a stand with us. The second thing I ask is to visit our blog, www.longislandwins.com and leave messages of support for Marcello Lucero’s family and the people in New York who are coming to support them in this difficult time. Take pictures with signs of support. Show the Lucero family that there are loving and caring strangers in this world. Show Suffolk County politicians that the whole world is watching. Racism, as it turns out, is not over. I was wondering when this vicious murder was going to get some attention. This crime occurred last Saturday and as far I can tell today is the first article the NY Times has written about (though NY Newsday has been all over it). For good measure, they add an editorial http://www.nytimes.com/2008/11/14/opinion/14fri2.html?ref=opinion in today’s edition which points to the role the county executive Steve Levy (who by the sounds of it ought to be indicted along with the rest of these creeps) has played in fomenting the anti-immigration anger and now tries to absolve himself of any role. What I find the absolutely most telling (in a long line of ‘most tellings’ in this awful crime) is the charges filed against the defendants. The animal accused of sinking the knife into the body of Mr Lucero is charged with manslaughter and first degree gang assault. I read this 5 times to make sure I didn’t miss the second degree murder charge. I didn’t. It doesn’t appear to have been filed. How is this possible? The prosecution alleges that this pack sought out to “attack a Mexican”. Does this not rise to the charge of Murder??? (understanding that these are often plea-bargained down once the case goes to trial). This absolutely astounds me. Might the race of the perpetrators play into this decision as well? Further, why is it that in most other commission of crimes, the law doesn’t distinguish between the actual and killer and those who are with him/her? Yet in this case no other person is even charged with manslaughter? “Friends of Mr. Conroy and the other suspects insisted that the defendants were not racist and said they were shocked that a frivolous escapade by bored, drunken teenagers had quickly turned tragic. They pointed out that one of the defendants, José Pacheco, 17, is the son of an African-American mother and a Puerto Rican father, and that Mr. Conroy counted Latino and black classmates among his closest buddies. Feel better now? It was just an escapade fueled by boredom. I kinda remember trying to climb a water tower as high school escapade fueled by boredom and alcohol but i guess times have changed. And further, these charming boys even had black friends. So there. Excellent insights, Jessie and Mordy. This shows just how dangerous the white racist frame of Americans of color really is, including in the head of one person of color. The attacks on Mexican and other Latinos are a result of all the blatant and subtle racism directed against them, such as in the national English Only and Minutemen movements which pretend to be about English and immigration but are really anti-Mexican at base. And almost no white political or other leaders speak out openly and regularly against this blatant anti-Mexican racism, even when it reaches to murder. Hey Mordy, Joe ~ excellent comments as usual. Yes, Mordy, I feel much better knowing that these white boys were not racist. *Not. * And, the fact that a couple of the young boys involved had “black friends” or, were of non-white backgrounds doesn’t diminish or change the fact that this was a racist murder. There’s an astonishing lack of critical awareness of racism on Long Island (I taught there for awhile) and it’s really going to have increasingly horrific consequences as Nassau and Suffolk counties shift from the GI-bill-sponsored and Robert-Moses-designed racial segregation to more racial/ethnic diversity of the population. People like Steve Levy are clearly making the situation worse. Jessie- Would you agree that there is an astonishing lack of awareness of racism in much of New York City and surrounding areas? Its reputation as a melting pot obscures the fact that like much of rest of the country it remains largely residentially and educationally segregated. By now you’ve probably seen that 2 teens have been arrested for a hate crime in Staten Island, another highly segregated part of New York City. They were also good kids. Says so right in the article. I remain very troubled and puzzled by the fact the 7 defendants in this case have been charged with what seem to be relatively light charges given the heinous, senseless and premeditated attack of an unarmed and unassuming pedestrian. I’ve read that the grand jury has handed up indictments but they remain sealed until Tuesday. Does anyone know if they can return indictments of more serious charges if they have not been filed by the prosecutor? The blog you have referenced in your post contains pictures and links to material which clearly indicate that these ‘good boys’ are not really so good. Do parents of 16 and 17 year old boys not see nazi tatoos on their child’s body and wonder what exactly is going on? there is an astonishing lack of awareness of racism in much of New York City and surrounding areas? Its reputation as a melting pot obscures the fact that like much of rest of the country it remains largely residentially and educationally segregated. I did see the news about the beating on Staten Island, there’s more here, in case other folks missed it. I don’t know Staten Island at all, but my experience of Long Island is that it has some unique features that contribute to a peculiar form of racism that’s different from any other place. For instance, Nassau/Suffolk counties have an isolated and insular quality (many of my students had never been to the city despite the fact that they lived only a 45 minute train ride away, and the majority had grown up there and never wanted to live anywhere else). In addition, the white ethnics there have experienced relative economic success while at the same time fleeing the “animals in the city” (I heard this kind of language often) while living in a suburb with a history of Klan activity and that was founded on deeply racist GI-bill. And, the proximity to the “melting pot” lends a patina of “we are all equal here” to the cultural milieu. More recently, there has been – as the NYTimes article in the original post above notes – a fairly dramatic increase in the number of immigrants living in Nassau/Suffolk counties. These immigrants are mainly poor, working as day laborers – doing jobs that white residents on Long Island have no interest in doing, yet the immigrants get vilified for “taking jobs away” from other workers. All these factors swirl together to create both a sense of assurance that Long Island is place removed from the problem of racism (this isn’t the South after all!) and with it, a profound reluctance to examine racism. So, yeah, I was not at all surprised to read in the article that the parents of these boys who committed the hate crime are defending them as “good boys” who are “not racist.” No one is on Long Island. Charges in this murder have been upgraded. Perhaps some sense of justice will prevail. A second degree murder charge has been filed against Jeffrey Conroy and the rest of the men now face conspiracy charges in the murder. 2 of the men now face additional charges of second degree assault as a hate crime for a separate BB gun attack on another Hispanic man. Racism is still alive and I feel like we will eliminate this for good one day. Go check out my blog website, the information on there will help eliminate racism once and for all.